132 new solar panels on the roof of Ackerman. They are UCLA's first solar-power project, and will supply enough energy to run 20 homes. Kennan Cronen may have graduated in 2011, but he’s left his mark on UCLA for many years to come: He’s the driving force behind the installation of the campus’s first solar panels to help power a building. 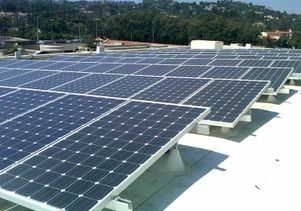 The student-led project allowed UCLA Facilities Management to install 132 solar panels on the roof of the student-owned Ackerman Union. The panels began to supply about 2.5 percent of the building’s electricity when they were hooked into the grid Wednesday. The new panels are expected to produce 130,000 kilowatt-hours per year, enough energy to run 20 homes annually. Cronen got the ball rolling in 2009 when, as a junior, he started BGreen Consulting with friends and applied to UCLA’s The Green Initiative Fund (TGIF) for funding to install the solar panels. Students created the TGIF grant program in 2008 by voting to each pay a $4 fee every quarter. This has raised about $200,000 per year for student-initiated sustainability projects on campus. In 2009, as one of the few applicants, BGreen Consulting’s solar-panel project received $176,000, the largest TGIF grant to date. Now, after years of planning and budgeting, the solar panels are a reality. The excitement the project has generated among students has also significantly increased the number of applications to TGIF, said Cronen, who was a political science major with a minor in environmental systems and society. It’s a great project, said Kelly Schmader, assistant vice chancellor of Facilities Management, and one that Facilities could not have done alone. Because solar panels take much longer to pay for themselves than other energy-efficiency measures, the department doesn’t have the luxury of considering them for its own projects. While Facilities has made the campus more sustainable with projects like making UCLA’s heating, cooling, ventilating and lighting systems more energy-efficient, the students’ solar panel project nicely complements the work going on in other parts of the campus, Schmader said. The TGIF program is designed to support student projects that go above and beyond what campus departments fund, added Roy Champawat, director of the student union for ASUCLA. He’s thrilled to see the project on Ackerman’s roof and only wishes the panels were more visible. Although UCLA already uses solar water heating for several of the campus residence halls, the 38 kilowatts of photovoltaic solar panels on Ackerman’s rooftop will be the first to provide power to a campus building. The $12,000 annual savings would be even higher if Ackerman did not receive low-cost, efficient power, primarily from UCLA’s cogeneration power plant, also run by Facilities Management. The plant meets about 75 percent of UCLA’s electricity needs with cleaner power than the Los Angeles Department of Water and Power, which supplies the remaining 25 percent. The solar panels, like other energy-efficiency projects on campus, reduce the amount of energy the campus needs to purchase from the city utility, which in turn reduces UCLA’s greenhouse gas emissions. Student and administration energy-efficiency projects are bringing the campus closer to its goals of returning greenhouse gas emissions to 1990 levels by 2020 and becoming climate-neutral. Even after getting approved by TGIF, Cronen and his classmates had their work cut out for them — they spent two years getting campus approvals, designing the project and financing it. With the rebate program reinstated, the Department of Water and Power inspected the solar panels Wednesday and gave its thumbs-up to the project.